Switzerland's parliament has voted to pardon its citizens who fought against Franco in the Spanish Civil War. Hundreds of Swiss men and women volunteered with the Spanish Republican forces in the 1930s, despite it being illegal to fight for a foreign army. They often received harsh treatment on their return - many were jailed and stripped of their citizenship. Switzerland is the last country to lift convictions on its Spanish volunteers, only a handful of whom are still alive. 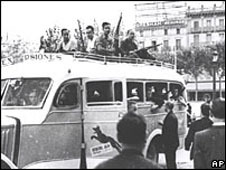 The Swiss contingent fighting with the Republicans in Spain was, proportionally, one of Europe's largest. But the Swiss government banned fundraising for Spain and made it illegal to fight for a foreign country, saying doing so was necessary to defend Switzerland's long-held tradition of neutrality. The BBC's Imogen Foulkes in Berne says that despite years of campaigning, previous attempts to pardon the volunteers failed. Opponents of the proposal had said a pardon would be tantamount to rewriting history, says our correspondent.